The program is administered by a trained facilitator and co-facilitator within classrooms. Facilitators can be teachers or mental health practitioners (e.g., clinical psychologists). Training and 4 hours of supervised practice is required to run the program. Student and teacher manuals are provided. Brief, coping skills interventions targeting personality risk factors have been tested in randomised controlled trials, showing benefits that last for up to two years.The Preventure program has proven both feasible and effective when delivered by trained school-staff. The Preventure materials were developed in Canada but are culturally adaptable and have been adapted for implementation in Australia. In order to implement the Preventure program, it is necessary to attend a 2-3 day training workshop. These training workshops are run in Montreal, Canada, but alternate arrangements may be possible. See the program website for information about the training workshops and costs for the program materials. Facilitator training workshops are currently being offered in Australia. The next workshop will be held on the 15-16 April 2019, at the University of Newcastle, Callaghan. Register now for this workshop. At the bottom of this page you can register your interest to be informed about upcoming facilitator workshops. Preventure training in Australia is proudly supported by the The Matilda Centre for Research in Mental Health and Substance Use at the University of Sydney, (formerly the NHMRC Centre of Research Excellence in Mental Health and Substance Use at the University of NSW) and Positive Choices. Reduced frequency of illegal drug use. Mahu, I. T., Doucet, C., O'Leary-Barrett, M., & Conrod, P. J. (2015). Can cannabis use be prevented by targeting personality risk in schools? 24-month outcome of the adventure trial on cannabis use: a cluster randomized controlled trial. Addiction, 110, 1625-1633. Conrod, P. J., O'Leary-Barrett, M., Newton, N., Topper, L., Castellanos-Ryan, N., Mackie, C., & Girard, A. (2013). Effectiveness of a Selective, Personality-Targeted Prevention Program for Adolescent Alcohol Use and Misuse A Cluster Randomized Controlled Trial. JAMA Psychiatry, 70, 334-342. O'Leary-Barrett, M., Mackie, C. J., Castellanos-Ryan, N., Al-Khudhairy, N., & Conrod, P. J. (2010). Personality-Targeted Interventions Delay Uptake of Drinking and Decrease Risk of Alcohol-Related Problems When Delivered by Teachers. Journal of the American Academy of Child and Adolescent Psychiatry, 49, 954-963. Three additional trials and 5 published studies support the benefits of the program delivered by a psychologist or experienced special needs teacher. Three of these papers are listed below, for a full list of evaluation studies, see Preventure Research. Teesson, M., Newton, N. C., Slade, T., Carragher, N., Barrett, E. L., Champion, K. E., Kelly, E. V., Nair, N. K., Stapinski, L. A., Conrod, P. J. (2017). Combined universal and selective prevention for adolescent alcohol use: a cluster randomized controlled trial. Psychological Medicine, 47, 1761-1770. Conrod, P. J., Castellanos-Ryan, N., & Mackie, C. (2011). Long-Term Effects of a Personality-Targeted Intervention to Reduce Alcohol Use in Adolescents. Journal of Consulting and Clinical Psychology, 79, 296-306. Conrod, P. J., Castellanos-Ryan, N., & Strang, J. (2010). Brief, personality-targeted coping skills interventions and survival as a non-drug user over a 2-year period during adolescence. Archives of General Psychiatry, 67, 85-93. Newton, N., Conrod, P., Slade, T., Carragher, N., Champion, K., Barrett, E., Kelly, E., Nair, N., Stapinski, L. & Teesson, M. (2016). The long-term effectiveness of a selective, personality-targeted prevention program in reducing alcohol use and related harms: a cluster randomized controlled trial. Journal of Child Psychology and Psychiatry, 57, 1056-1065. Lammers, J., Goossens, F., Conrod, P., Engels, R., Wiers, R. W., & Kleinjan, M. (2015). Effectiveness of a selective intervention program targeting personality risk factors for alcohol misuse among young adolescents: results of a cluster randomized controlled trial. Addiction, 110, 1101-1109. 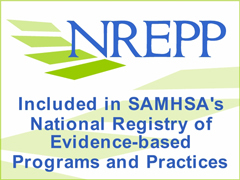 The Preventure program is included in SAMSHA's National Registry of Evidence-based Programs and Practices (USA). Register your interest in the upcoming Preventure training workshops in Australia! We will then contact you with further details. No need to provide your details below if you have previously registered your interest through Positive Choices (we have your details!). Positive Choices respects your privacy. Please read our Privacy Statement.